Vol. I of Hitler’s philosophy is titled “Reckoning,” having to do with early history of his National Socialist movement and how he began his public meetings. Vol. II is titled, “The National Socialist Movement.” This includes 15 chapters of historically interesting material seen from Hitler’s personal animas toward everyone but the Aryan race. Here we find the beginning of the SA, “a body for the protection of the meetings,” also called Storm Troopers, the Monitor Troop, and the Storm Section (sturmablteilung). Hitler believed in fighting force with force. Much is here on his use of the trade unions which he used for political support by catering to their “folkish” needs, meaning their right to take what otherwise belonged to the rich business owners. The purity of German blood always stood as the highest goal for a true German. Anything is permissible if it resulted in protecting the German (“folkish”) culture . “The mass meeting is also necessary for the reason that in it the individual, who at the first, while becoming a supporter of a young movement . . . For the first time gets the picture of a larger community, which in most people has a strengthening, encouraging effect. . . When, as a seeker, he is swept away by three or four thousand others into the mighty effect of suggestive intoxication and enthusiasm, when the visible success and agreement of thousands confirm to him the rightness of the new doctrine and for the first time arouse doubt in the truth of his previous conviction—then he himself has succumbed to the magic influence of what we designate as ‘mass suggestion.’ The man who enters such a meeting doubting and wavering leaves it inwardly reinforced: he has become a link in the community. The National Socialist movement must never forget this” (p. 478-479). 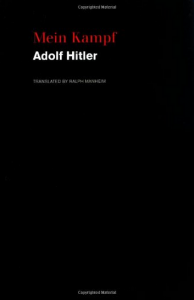 Hitler admitted, “I was a master of this art” (p. 467).